EpiGrammer™ is a data evaluation program for the calculation of enhanced sensorgrams from raw SPR instrument data. 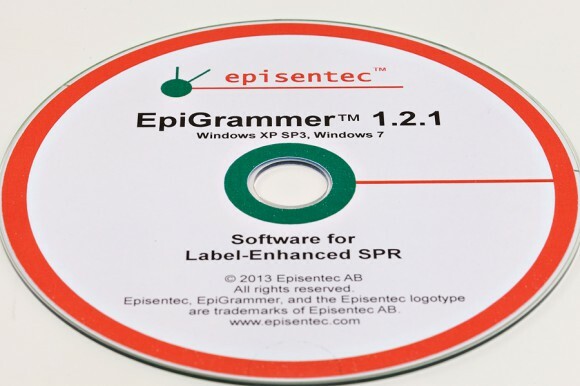 Based on the Label-Enhanced SPR technology of Episentum, EpiGrammer refines the sensorgram to enhance sensitivity and specificity. Using EpiGrammer, you can import data files from standard SPR instruments, interactively calculate enhanced sensorgrams, and re-export the enhanced sensorgrams for downstream data evaluation, including kinetic evaluation. EpiGrammer is currently available in version 3.1. EpiGrammer 3.1 is directly compatible with Biacore™ Classic/2000/3000 and Biacore™ T100/T200. For other Biacore™ models, please enquire. Since EpiGrammer is the name of the tool used to refine the data, the resulting enhanced sensorgrams are commonly referred to as “epigrams”. Episentum offers tools for improved kinetic model-fitting and kinetic evaluation of sensorgrams. Enhanced sensorgrams, or epigrams, are often cleaner and less prone to disturbances than conventional sensorgrams. Effects from the bulk refractive index (also known as solvent effects) are often negligible, which minimizes the need for modelling these effects. In addition, subtraction of the reference channel sensorgram is often unnecessary, which avoids the annoying sharp spikes due to small time differences between sample and reference channel. In particular, due to the high specificity of Label-Enhanced SPR, one of the components is “invisible” when evaluating competitive kinetics, which results in a simplified and more robust kinetic model. We offer a range of ready-to-use models for kinetic model-fitting of epigrams. We can also custom-design new models to meet your specific needs. For orders and product enquiries, please contact us at: sales@episentum.com.